Her Majesty Queen Sofía of Spain has been visiting the Philippines, a former Spanish colony, which the Kingdom ceded to the USA in 1898 after the lost Spanish-American War. The new colonial masters stayed until 4th July 1946, when the Philippines attained its independence. The acting president of the republic is Benigno S. Aquino III [sic!]. The Spanish Queen arrived on 1st July and will leave the archipelago on 7th July. It is her third visit to the Philippines after 2002 and 2003. She has visited different development and relief project carried out by Spanish aid workers, local NGOs, religious institutions and UN agencies, especially the UNDP (United Nations Development Programme) to whose Millennium Development Goals Spain has made great contributions. 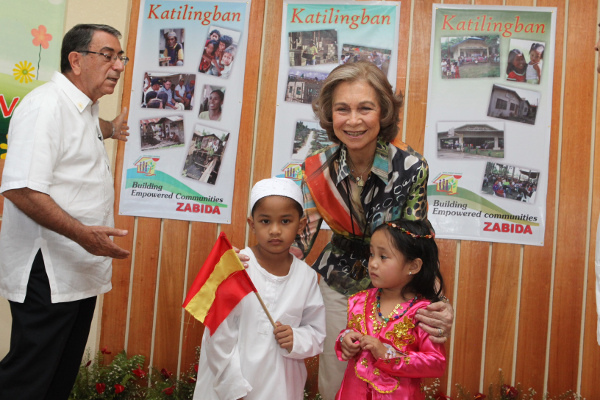 Doña Sofía’s journey reflects Spain’s wish to accompany the Philippines in its sustainable development. Cooperative relations between the Philippines and Spain date back to 1974. Over recent years, Spain has become one of the country’s largest donors. The official development assistance from Spain to the Philippines has averaged 30 million € per year between 2006 and 2010. The main Spanish cooperation programmes have targeted the areas of democratic governance, health, education, relief, climate change and support the peace process in Mindanao. 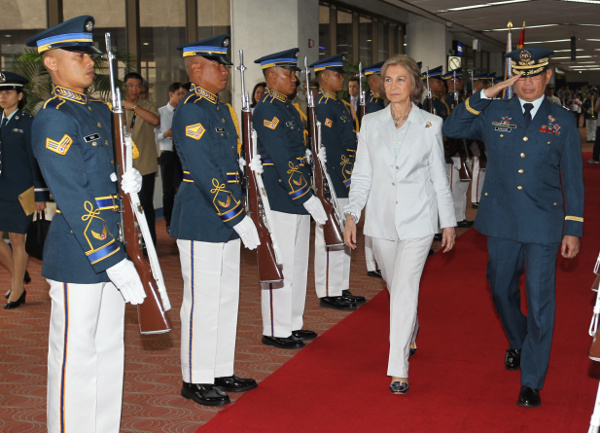 In this video clip Queen Sofia visits the University of Santo Tomas. The university was founded in 1611 by Spanish Dominican friars when the Philippines was a colony of Spain was just one of Sofia's many stops. Viaje de Cooperación de Su Majestad la Reina a la República de Filipinas del 1 al 7 de julio de 2012. En esta tercera visita de Su Majestad a este país, tras las realizadas en 2002 y 2003, la Reina conoce sobre el terreno los diferentes proyectos que se están llevando a cabo y a las autoridades y contrapartes filipinas, los beneficiarios directos de las ayudas y los actores de la Cooperación Española, principalmente ONGs y comunidades religiosas, así como diversas agencias de Naciones Unidas, sobre todo del PNUD, que coordina los programas para la consecución de los Objetivos de Desarrollo del Milenio, a los que España ha realizado grandes aportaciones. El viaje de Doña Sofía a este país, refleja la voluntad de España de seguir acompañando a Filipinas en su desarrollo sostenible y en sus políticas de inclusión social como país prioritario de cooperación.